Last post, we talked about the cropping component of the farm our friends own. Now, it is time to talk about the sheep. On the 2500 acres of paddocks, at any one time they devote about 30% of the space to pasture, while the rest is crops. Another means of diversification is dedicating a bit of space to a solar pane. This thing is computerized and follows the sun, to maximize output. It powers the house, pays for itself, and generates a small profit each day. The pasture serves a few purposes. One, it diversifies the farm. A farm based only on crops is taking a chance on a lot of things: growing conditions, market forces, etc. Sure, livestock also has these variables, but by working with a mixture of both crops and animals, chances are that most years at least one of them will be profitable. And there is a really complex mathematical process that determines how much land should be pasture and how much crop. Sheep at pasture are counted in terms of DSEs: dry sheep equivalents. That means how many sheep you can pasture on an acre of land. One ewe and one lamb are 3 DSEs. The fat lamb is worth $x at market, the ewe’s wool is worth $y when sheared (taking into account, or course, the cost of shearing, etc). 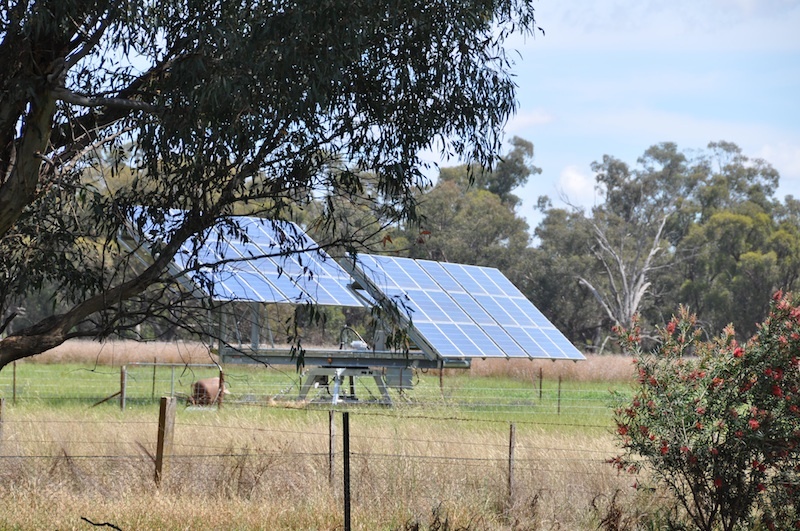 So depending on how many DSEs your land can support – which in itself is complex based on the type of grasses in the paddock, whether it actually has irrigation, etc – you have to figure out if your land is worth more as pasture or crops. And if a crop, what crop? This depends on how many tons per acre yield you get, how much each ton is worth, etc. Isn’t farming fascinating? We didn't actually get around to taking any photos of sheep. So here's a photo of the thing that Dan saw most over the weekend: Larry's tongue as he stood at his feet, waiting for a stick to be thrown. But then there is the next level of complexity, which we mentioned last post: crop rotation. Every few years, it makes sense to take a paddock out of cropping and let it be pasture, because it will help regenerate the soil, in turn upping the yield next time you sow a cash crop. That benefit is one that is hard to quantify, but has to be take into account. So, one of the things we learned on this trip is that farming is a science. A very precise science. Or more accurately, a lot of sciences: botany, meteorology, economics. But it is also a craft. And an art. And damn hard work both physically and mentally, and one that takes years to learn. Farmers work 24/7, living and dreaming about what the work they need to do every day and worry about what nature will throw their way. (Lisa edit: Just like academics! Only farmers get sweatier and dirtier… well, most of time). This is Badger. 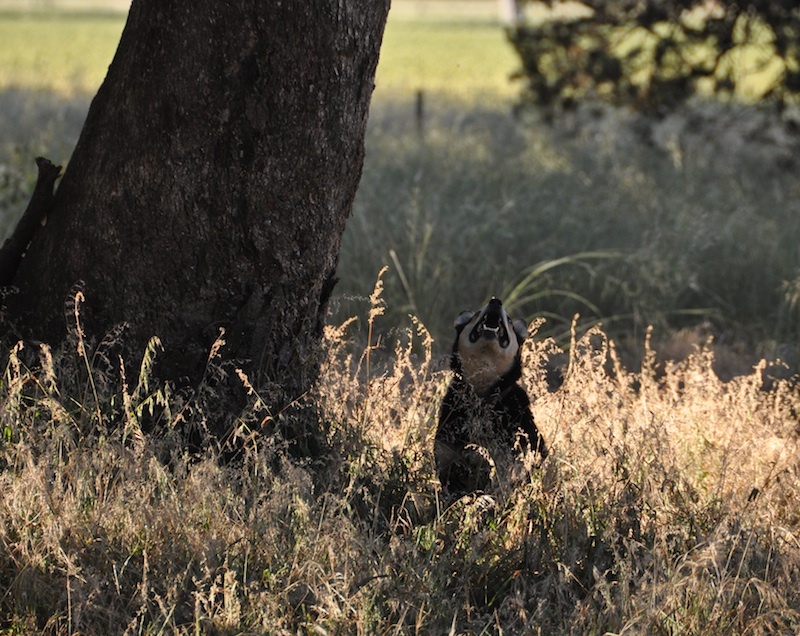 He is not only good at herding sheep, but he is good at treeing ring-tailed possums (possi?). He had a pair up there, and wasn't going to let them come down. The farm we were on has, typically, more than 1000 sheep. Some are lambs, there for a short time, being fattened for market. Some of these lambs are purchased, fattened and sold. Some are bred there, with the ewe also bringing in income from the wool. When we were there, TP had to work late on the Sunday night rounding up sheep to spray them for fly strike. There is a strange fly here (Australian sheep blowfly [Lucilia cuprina]) that lays its eggs on the sheep; while that fly doesn’t really do any damage, it creates an environment for other, more problematic flies, to also lay eggs. So, when it starts to strike, they have to quickly round up the sheep, bring them to the yard at the shearing shed, and spray them. With over 1000 sheep, this is a tough job. And this weekend, it was made even tougher by the fact that about an hour into the job, there was a “rain event.” It poured. Horribly. TP and Luca got drenched. The sheep stopped moving. 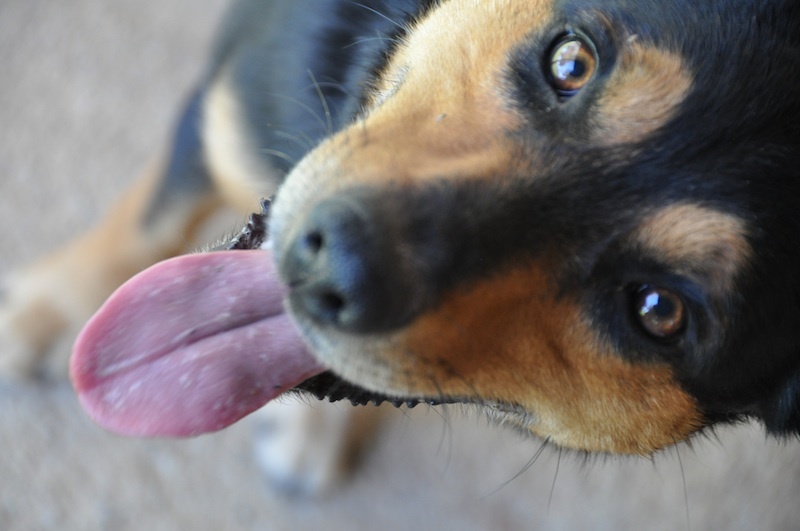 Even Rocket, the adorable kelpie with a deformed jaw (that means she can’t keep her tongue in her mouth), just shut down. So, a crappy job that should have taken them until early evening took many hours, and TP didn’t make it back to the house for dinner until about 8 pm. Farming, it seems, isn’t a fun job. Shearing shed? Or some strange torture chamber? The best part about this is the bottle of tomato sauce (sort of the Aussie ketchup) in the background. Do the shearers actually eat lunch (probably a pie or a sausage sanga) here? Yuck! 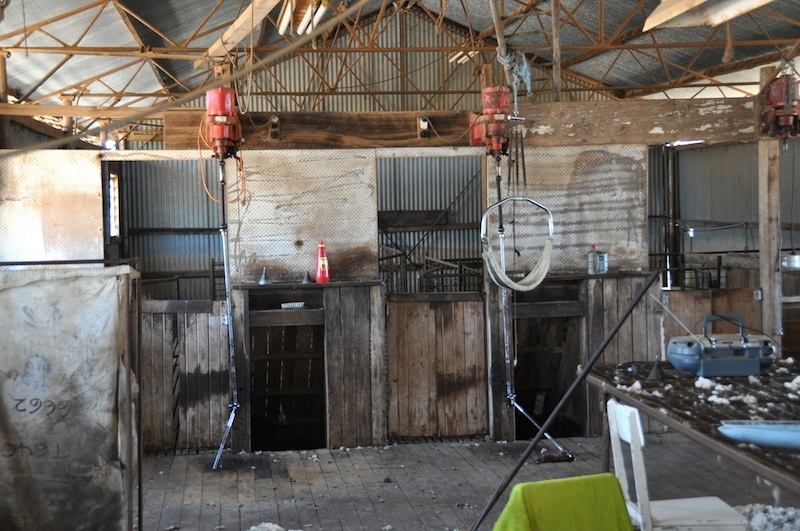 On the afternoon component of the Saturday farm tour, we visited a couple of shearing sheds on the property. These were pretty interesting old buildings (that forced Lisa to get over her spider fear!). They are old and run down, designed for one purpose only. Both of the ones we went to were OK, but not great. The shearers work on ground level, which means the wool gatherers have to bend to pick up the wool. A better shed, according to TP, would have the shearers work on a platform, so the wool could then just be grabbed at chest height. This is not only faster, but also easier on the gatherers. Australia is very much an OHS country! Shearing sheds are pretty cool, but unfortunately something that is dying out as the wool industry gets smaller. They used to once be prominent on the Australian landscape, but many have gone into disrepair. Fortunately, someone is documenting this heritage before it is gone completely (and see here too). On the way home from the sheds and the fields, we stopped off at a neighbour’s house to pick up a lawn mower. The grass at Bilawi needed cut, because they keep it well watered. This isn’t just for aesthetic purposes: it is a safety measure. Green grass burns slower than brown grass, and in Australia you do everything you can to slow down wildfires. While we were there, the sprinklers around the house ran most of the day, drawing water from a dam on the property where most of it would be collected again, later. If a fire raged through the area, it would destroy the crops but the house would be safe. We were surprised at the small size of orange trees. This small grove also had grapefruit (we got a dozen of those), tangerines, lemons, and figs that were just starting to ripen. 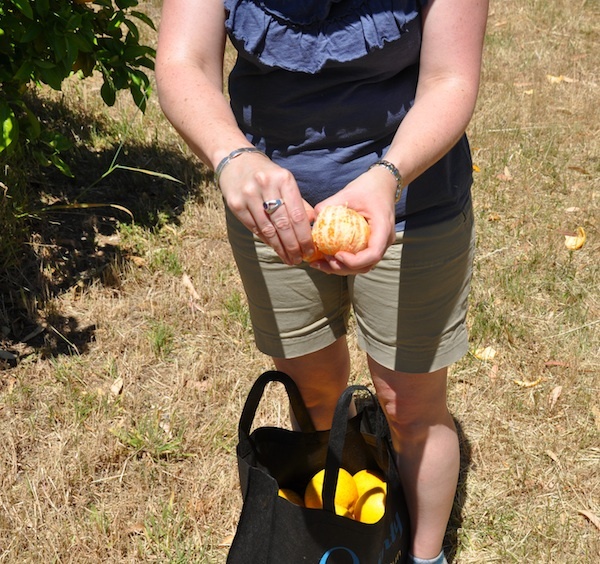 While at this neighbour’s house, we raided a small citrus grove. The orange and grapefruit trees were still bearing fruit, but the lemons were done for the year. We picked a huge bag of fruit and ate a few things there. There is nothing in the world like eating an orange right off the tree on a 33 degree day. Heavenly! Unfortunately, the figs aren’t ripe yet but we are waiting for that season. We also ate mulberries, fresh from the tree. Amazing! There's nothing better on a hot day than a hot orange fresh off the tree. Yummy! The whole environment here still boggles us. People here take it for granted that there are grapefruit and figs and kumquats; they take it for granted that somewhere in the country, there is always fresh fruit. Sure, Queensland might be a ways away, but it isn’t like in Canada where we were getting fruit from South America. 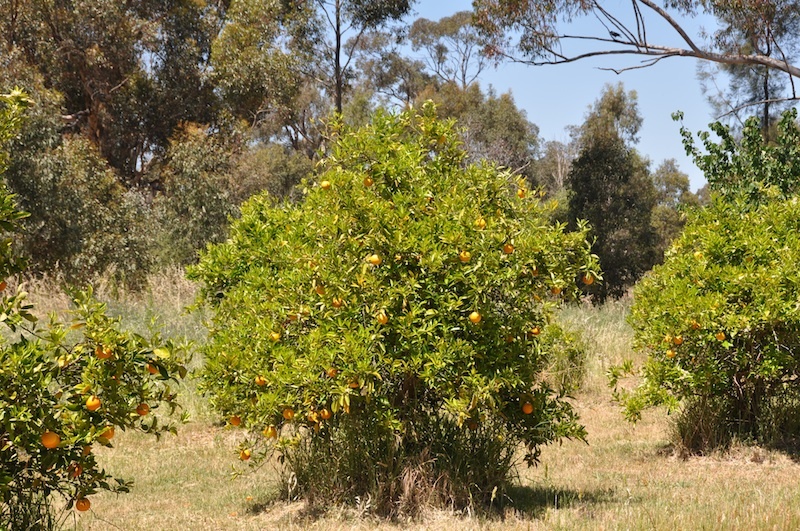 It also drives us crazy that our neighbours have left mandarins on a tree in their backyard, untouched for weeks! Dan’s been planning a midnight raid. So we marvel at things like going to pick grapefruit; maybe some day we will get used to it, but we will never take it for granted. And we can’t wait to plant our own trees! This entry was posted in agriculture, Australia, citrus, Corowa, farming, sheep, sheep shearing. Bookmark the permalink.